Mike Strantz, Forrest Fezler and the Legacy of Maverick Golf Design. In 2001 the Maverick design team was working on a renovation project at Silver Creek Valley Country Club in San Jose, California. The course received a considerable overhaul taking it from a mundane march through the California foothills to a much more visually interesting course with exciting shots baked into each hole. While working in California, Forrest Fezler got a call from an old friend about his home club and their ongoing course renovation project. Fezler’s friend phoned him to discuss his disappointment in the renovation process that was unfolding at Monterrey Peninsula Country Club. The lavish club had hired Arnold Palmer Design to conduct a serious renovation to 18 of the club’s 36 holes. Progress had stalled and help was needed to move forward. 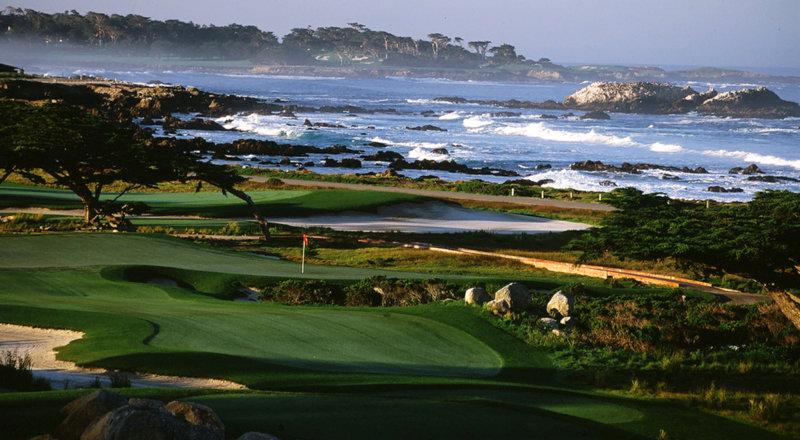 The Monterey Peninsula Country Club lies over some of the most desirable land for a golf course in America. The club has been on the Monterey Peninsula since 1925 and it consumes a massive amount of ocean front property there. The club has two 18 hole courses on its spectacular grounds. The Dunes course and the Shore course. The Dunes course was the original golf outlet for the club. Seth Raynor provided the layout and then after he passed away from an untimely death, the course was built and finished by Robert Hunter and Alister MacKenzie. The shore course was built by Robert Baldock in 1960. That course had a routing that went by the sea on multiple holes, but was not considered in the same class as its neighbors on the 17 Mile Drive. The members of Monterrey Peninsula Country Club were determined to change that dynamic. When Fezler got a call to come take a look at the project, Mike Strantz and he were immediately interested but also hesitant to invade into another company’s project. The mavericks agreed to take a meeting but insisted that they were not looking to take work from another firm. The conversation that took place would end up being the beginning of a beautifully sad ending to the Maverick Golf Design team. When Strantz and Fezler met with members from Monterey, they began by listening. The members walked the mavericks through the many issues that had arisen with the Shore course renovation. Most notably, the Arnold Palmer team had told the membership that their vision could not be achieved with the many restrictions being placed on them from the California Coastal Commission. The California Coastal Commission is a strict enforcement agency of the State that oversees all development activity within close proximity of the coast line. It is safe to say that many of the great California courses such as Cypress Point and Pebble Beach would not make it through the Commission’s approval process today. The membership of Monterey Peninsula Country Club had reached its wits end with their renovation project and their chosen vendor’s inability to get things going. 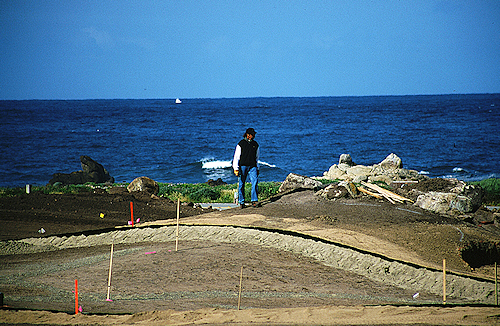 In January of 2002, Maverick Golf Course Design was awarded the opportunity to lead the renovation of the Monterey Peninsula Country Club. The mavericks had been offered the opportunity of a lifetime. They would be renovating a course on some of the most revered grounds for golf in America if not the world. The chance to lead a renovation on the Monterey Peninsula was high profile and potentially career-defining. During a time that should have been an incredible high for the Maverick design team, Mike Strantz received some devastating news. Strantz was told that the small lump on his tongue that had bothered him for some years was cancer. Despite his cowboy looks and attitude, Strantz neither smoked nor used chewing tobacco. The cancer was a serious but treatable diagnosis and the doctors would need to act as soon as possible. Strantz would soon undergo surgery to remove portions of his tongue and his lymph nodes. He would need chemotherapy and a strenuous treatment plan to cure the disease. Mike Strantz believed that there was another kind of therapy he needed to cure his cancer. He believed that he needed to work. 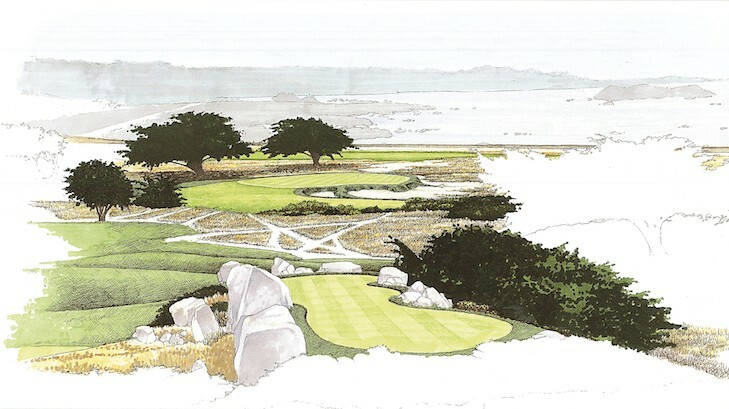 In January of 2003, Mike Strantz and the entire Maverick team moved to the Monterey Peninsula and began working on what would become his final golf course design. Mike Strantz was at home in nature. The sights and sounds of a serene setting always inspired the artist in him to grab his pad and start sketching. Designing golf courses was how Mike Strantz worked as an artist. He could see the land for how it could be and his hands were capable of crafting images that climbed right out of his imagination. On the shores of the Monterey Peninsula, that work became a form of therapy. Mike Strantz the golf architect was working on the most important project of his career. He was also a cancer patient fighting through the toughest months of his life. During the time he was working in Monterey, Strantz continued his intense chemotherapy treatments to combat the tumor that was wrecking his world. There was hope in him and his team that those efforts would keep their friend alive and working well beyond his age of fifty. Mike Strantz was undergoing medical treatments for his health, but he sought out his sketchbook to help heal his soul. On the plot of land at the Monterey Peninsula Country Club where he was preparing to shape a new golf course, he found a favored place where he could feel inspired and work on his art. Each day, Strantz would climb to an outcropping of rock from which he would sit and sketch what he wanted the land to look like as a golf course. The land Strantz was granted to construct the Shore Course upon was the most special he had seen in his career. From the top of the rocks he sat on each day, Strantz could see all the way across the coves of the sea to Cypress Point. He could hear the waves crashing in the ever-raging Pacific with the seals barking in concert. The wind that shapes the ancient dunes by the shore there also stirred the pages of his sketchbook. Mike Strantz watched from the rocks as the sun sank over the water every evening, knowing that the same light may also be setting on his life. Strantz’s vision for the Monterey Peninsula Country Club was a complete overhaul from the course that had sat there previously. 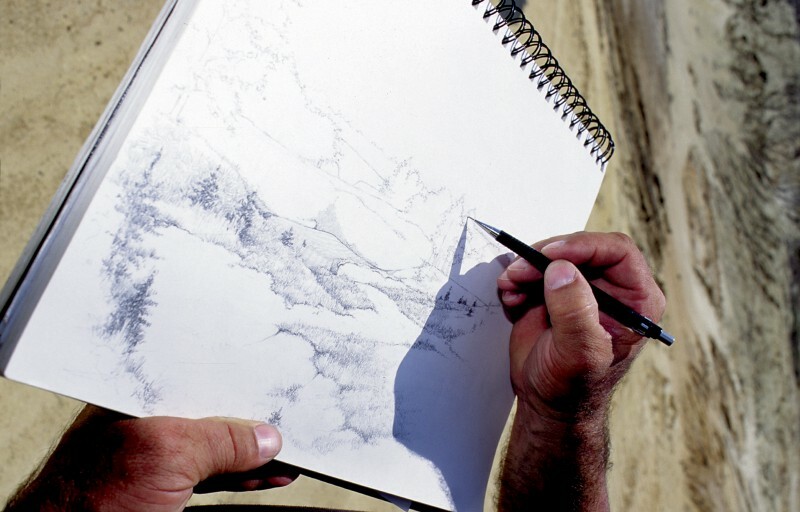 Strantz drew up new holes that stretched along the shore to better incorporate the sights and sounds he was experiencing while drawing them. He included natural elements while routing his new design through the existing features that had sat there neglected by the original layout. Stricken by the aftershocks of his cancer treatment, Strantz was still working as hands-on as ever to deliver an amazing golf course for the club. 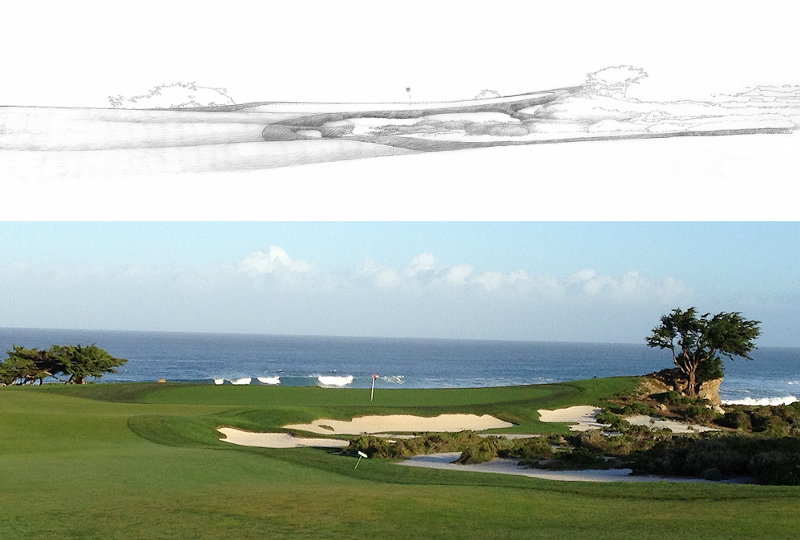 A sketch of the 15th hole at MPCC Shore Course above and the hole as it sits today below. Mike Strantz’s favorite rock outcropping is on the right side of the 15th green. Mike Strantz was a lover of golf history and a subscriber to the theories of Dr. Alister MacKenzie. Strantz was elated at the chance to work on a golf course within sight of MacKenzie’s masterpiece at Cypress Point. He felt it was an honor to be able to work on some of golf’s most treasured landscapes on the Monterey Peninsula. He found added inspiration in the idea that one of his golf courses would forever sit just down the street from the likes of Pebble Beach and Cypress Point. He poured that added motivation into his work. Strantz found great joy in being with his team and working with them on a career-defining project. Strantz was focused and committed to delivering his best work yet. His team, especially Forrest Fezler, were just as invested, but they were also worried about how their friend was doing. It was obvious that as the work continued, Mike Strantz’s health was continuing to decline. Strantz looked like a shell of his former self. His long dark hair had fallen away and he had lost nearly eighty pounds. The surgeries to his tongue also took their toll on his appearance. Strantz’s voice had become nearly inaudible to everyone except his wife and Forrest Fezler. Despite these external changes, Mike Strantz’s spirit was strong and his work ethic was unfazed. One particular day, a group of members came out to see the ongoing work. As they approached the job site one of the club leaders pointed out a frail man on the horizon and said to the group, “There is Mike Strantz, the golf architect”. They observed as the artist walked the grounds and planned the next phase of the build out. The members were stunned by how different the man looked and how hard he was working. The whole scene brought Forrest Fezler to tears. As the team worked on to make Strantz’s vision become a reality, they were faced with the looming knowledge that this may be their final ride together. The construction of a golf course does not happen in a numerical sequence. The holes are built according to a work plan that allows for the site to be properly staged throughout the process of shaping, planting, and growing. During the construction of the Shore Course at the Monterey Peninsula Country Club, the Maverick Golf Design team saved the eleventh hole for its last piece of the construction puzzle. The eleventh hole at Monterey is a gorgeous downhill par three. The teeing ground sits on top of a rock outcropping that provides sweeping views of the entire golf course with the Pacific Ocean in the background. The tee shot there is the highpoint on the golf course and it happens to be the crescendo of a round played there. The vista there is the signature place for photos and unforgettable shots for those lucky enough to play the course. As the construction of the Shore course kept inching toward completion, both Mike Strantz and Forrest Fezler would keep looking in the direction of that outcropping of rocks that would soon become the eleventh hole. Both of the Maverick’s knew that they had to get that hole right to bring the full potential of the golf course in for a landing. They also knew that the small levels of certainty they were clinging to likely would end when that hole was finished. Neither partner could say for certain if there would be a next course project. The demand had never been higher for the mavericks, but the cancer’s effects on Strantz were becoming more and more worrisome. Strantz was fighting for his life and putting everything he had left into the Shore course. One evening as the Shore course was nearly complete, the two mavericks climbed to the top of the new tee-box of the eleventh hole. Mike Strantz and Forrest Fezler stared out over the sea together and watched the waves dance from the top of the world. In just under a decade the two partners had built an impressive business together and now they stood at the peak of their careers. The Shore course was approaching completion and so was their time together. Looking out over their creation, Mike Stantz turned to Forrest Fezler and said to his partner, “This is our last hole.” Surely there was hope in each of them that those words were only meant for the Shore course, but in reality, both knew it likely meant forever. With the sounds of seagulls swirling above the site of their best course yet, the mavericks began work on what would indeed be their final hole. Mike Strantz died on June 10, 2005. One day short of a year after the grand re-opening of the Monterey Peninsula Shore Course. His cancer, believed to have been beaten on two occasions, finally proved to be too much to survive. One of the greatest golf architects in history passed away far too soon and with far too few courses to his name. The Shore course had opened to rave reviews. The course immediately found a firm footing in the top 100 courses in America rankings. In 2010, the Shore course was added to the rotation of courses that host the AT&T Pebble Beach Pro-Am. It is the only Strantz design that is played by the PGA Tour. Mike Strantz’s final work was indeed his best. No other course in his portfolio shares such a beautiful space with nature. 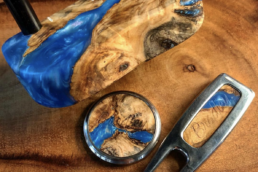 The eye of the artist is apparent on every hole. There are breathtaking views of the sea available with every swing. To walk there is to walk through the final days of Mike Strantz’s design career. The elements that made him a maverick are the same elements that make the Shore course one of the more unforgettable golf experiences in America. Forrest Fezler’s career did not end with the life of Mike Strantz. The last of the the mavericks keeps his nose the grindstone and continues to work on golf courses. Fezler founded his own company called Fezler Golf Services where he serves a a design consultant and a builder. Fezler Golf Services has been engaged through the years on numerous projects with a long list of architects including Davis Love III, John Fought, Arnold Palmer, Lanny Wadkins, and Johnny Miller. Fezler has worked with these famed designers on courses that fall on “best of” lists from all around the country. The work keeps him busy, but there is one client in particular that excites him the most. After Mike Strantz passed away, the Monterey Peninsula Country Club retained Forrest Fezler as its consulting architect. Every year, for a few months during the summer, Fezler returns to the course where he said goodbye to his best friend. Fezler works on a long list of projects for the club that are all aimed at preserving the intent of Mike Strantz’s final design. Forrest Fezler keeps copies of the original work plans close as he carefully navigates the Shore course each year in an aim to keep his friend’s dream alive. In those papers are the original sketches that were drawn by Fezler’s dear friend. The last sketches of Mike Strantz’s career still guide the work being done at Monterey Peninsula Country Club well over a decade since his death. Forrest Fezler makes his rounds at Monterey over the same ground where Mike Strantz lived out his days while pursuing the work he loved most. There are numerous places where Fezler finds comfort in the memory of his friend. He visits the tee box on the eleventh hole where they began their last days together. He stops by to read the plaque on the rock outcropping where Strantz made his sketches for the course. Throughout his days at Monterey, Forrest Fezler can’t help but still look for his friend in all the places where Strantz left lasting pieces of his soul. 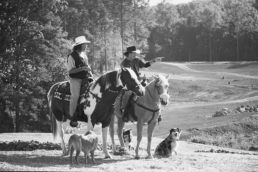 Mike Strantz and Forrest Fezler considered themselves to be the Mavericks of golf. Their stories are vastly different, but their spirits could not have been more aligned. Over the course of a decade, Strantz and Fezler built golf courses that are unique, beautiful, and ground breaking. Their maverick minded approach to golf course design has served as inspiration for an entire new generation of golf course architects. A look through the lens of history is the only way to view the work done by Mike Strantz and Forrest Fezler in full. The visionary designs that emerged from Strantz’s imagination have aged extremely well. Although Strantz could not have known it at the time, his work was part of the onset of a golf design revolution. 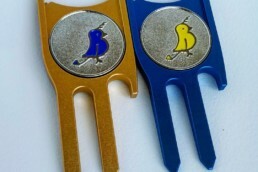 Maverick Golf Design was in part responsible for the ushering in of golf’s second golden age of course architecture. Mike Strantz was one of a handful of modern golf architects who all began building revolutionary designs at around the same time. Most notably, this group includes the team of Bill Coore & Ben Crenshaw, David McLay Kidd, and Tom Doak. Each of these acclaimed designers were coming into their own during the years in which Maverick Golf Design was finding its stride. Together this group of architects and their many acolytes of associates and shapers have changed the trajectory of golf course architecture for the foreseeable future. The common link between these designers is a dedication to the traditional principles of golf design. Golf course architecture took some strange turns in the years between World War II and the end of the twentieth century. Courses became less of an expression of recreation in the natural environment and more of a means to generate profits and sell real estate. Good land was used for homes not for golf. The resulting architecture was mundane, difficult, and unsustainable. Mike Strantz was part of the group that changed that. Mike Strantz and his contemporaries were all students of the great architects of golf’s golden age. Designers such as Alister MacKenzie, Donald Ross, A.W. Tillinghast, and C.B. MacDonald were all founding fathers of America’s greatest generation of golf course architects, and their work served as inspiration for Strantz and his peers. Mike Strantz believed that a golf course should be bold and filled with exciting shots that were created in harmony with nature. He believed that golf course design was art. His designs have been heralded by his peers as places that must be seen in order to better appreciate the possibilities of golf course architecture. Mike Strantz and Forrest Fezler often discussed and debated how a hole they were building might hold up to the scrutiny of fans, critics, and players who would someday see their work. The duo were aware that the work they were doing was different. Fezler expressed to Strantz that he was confident in the direction of their designs because at the amusement park the long lines are for the boldest rides. A Mike Strantz design was always more roller coaster than merry-go-round. Before his career and life ended, Strantz was on the same path as Coore & Crenshaw, Kidd, and Doak. Strantz was in demand and the demand for bold and imaginative courses was growing. 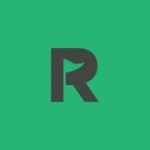 The real estate boom would have certainly led to some interesting work for the Maverick Golf Design team and even after the recession, they would have likely seen opportunities to work around the globe. Today, golf course construction has slowed and the biggest projects are being reserved for the best names in the game. Mike Strantz and Maverick Golf Design would have certainly been one of those names. Mike Strantz’s legacy as a golf course designer is incredibly unique. He may be the most heralded designer to reach such revered status with so few courses to his credit. In total, there are only nine courses that bare his name. The fact that Strantz is considered one of the best architects of all time is impressive, but achieving that level of high regard after only nine designs is an unparalleled achievement. Mike Strantz’s design career was brief, but his legacy is long. It is amazing to consider what his career may have evolved into should it have lasted another decade or more. Imagine if the other great architects, both modern and from history, had only nine designs to shape their reputation as a designer. With more time and more courses to his credit, Strantz would have assuredly crafted numerous other masterpieces. Mike Strantz’s limited work has served as a study for other aspiring architects. A new generation of designers has emerged from working as apprentices and associates for the leading design firms. The newest golf architects are putting their own spin on the principles championed by Mike Stratnz and his peers. There has never been so much promise for the future of golf course architecture and Mike Strantz continues to serve as beacon for the new golden age. The contemporaries of Mike Strantz are still building courses across the globe. The work of Coore & Crenshaw, Kidd, and Doak is without question among the best in the world today. New courses continue to be built and new architects still aim to design timeless courses built on the principles of the golden age. This entire body of work will someday be reviewed and remembered as golf’s second golden age. Mike Strantz will go down as one of the men who helped to usher that age in. Forrest Fezler deserves to be known as the partner who helped him build that legacy. Maverick Golf Design was more than just a firm of golf course architects. It was a partnership between friends who both rode through the world at their own pace. Mike Strantz and Forrest Fezler came together in a way that in hindsight seemed preordained. One maverick was an artist with a passion for grass and the other was a player and practitioner with a desire to build. Together, they worked on the cutting edge of golf design and helped start a new age for the architecture of an ancient game. Somewhere in the distant ranges of heaven, there is an artist who looks an awful lot like a cowboy. He is probably riding around on a horse with a couple dogs trailing close behind. That is Mike Strantz, the golf architect. He has a sketch book in his hand and he is searching for piece of ground to build some golf holes on. He will be waiting on his friend to join him for the work someday, but until then he just draws and looks out over the world. Meanwhile Forrest Fezler still travels the country turning dirt and shaping golf holes all the while missing his fellow maverick. One maverick rides in heaven, and the other lives on keeping their legacy intact. Each waiting for the time when they get to work together again. And that is my vision for the new Shore Course: A thrilling and timeless golf course that springs from the striking beauty of rocks and grasses and wind-swept trees beside a powerful ocean. A beautiful course with multiple teeing areas that can be enjoyed by everyone, no matter what their experience or skill. Sitting in a perfect Pacific Ocean setting, the Monterey Peninsula Shore Course has the potential to be one of the most dramatic golf courses in the game. The new course can be a breath-taking, exciting, and world-renowned course, but she has yet to realize her full potential. I hope to carefully shape this new course so she will bend and sweep with the natural terrain of rocks, trees, grasses and ocean. My dream is that she will appear as if she has been dancing among the cypress on this coastline forever, and now she is the new, wonderful discovery of just a few lucky people.